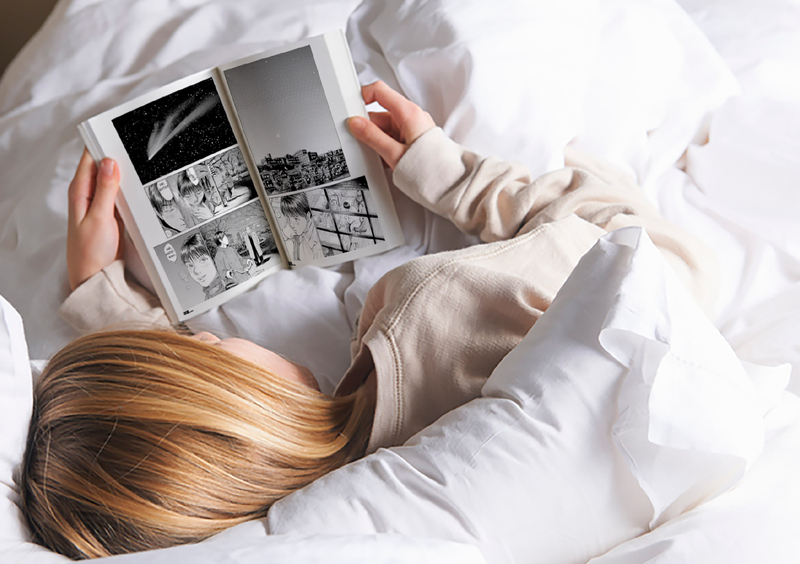 which provides its guests with an overnight experience enjoy art through manga. As we approach 2020 when Japan and Tokyo will be attracting the entire world’s attention, we are opening “MANGA ART HOTEL, TOKYO", a place to provide a never-before-seen accommodation experience in hopes of increasing the number of international tourists to Japan and to make them fall even deeper in love with Japan. For this, we focused on one of the cultural industries for which Japan is the most proud of—manga. The bookshelves set out in the facility, as if something from a different dimension, are filled with mangas which have been curated based on an artistic perspective. We have prepared reviews for all the titles of over 5,000 books. Here, what awaits you is an encounter with a magical manga series that you cannot know by simply being looking at the book displays. We have also taken extra care to alter the selection of mangas for the male floor and female floor. 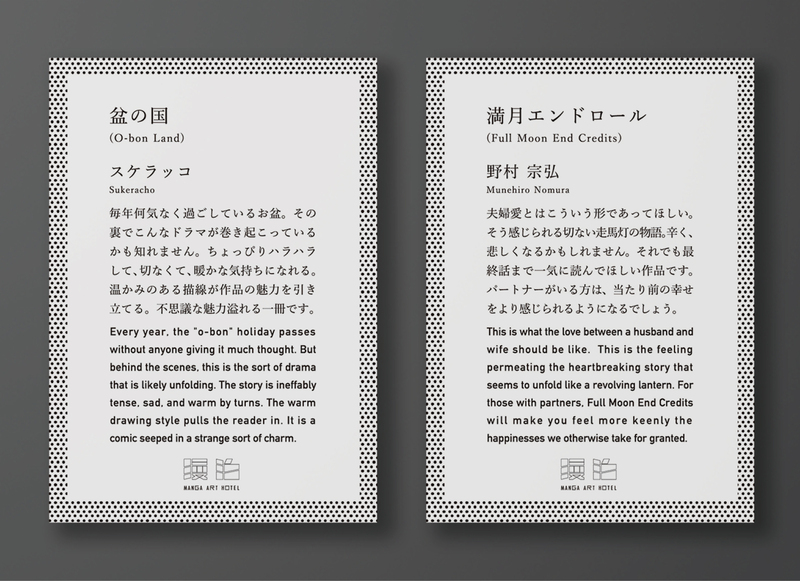 For international visitors, we have also prepared English versions of our mangas. Finally, all books here are available for purchase. Jinbocho, Tokyo’s book district. The streets are lined with countless bookstores and it is also the home to many offices of publishing companies. Here, Japanese culture reverberates like a basso continuo even today. This neighborhood where context and culture coexist will soon be the host of the new MANGA ART HOTEL, TOKYO.Not only will this serve as a space for manga-lovers to go crazy, but we also hope that international visitors to Japan will feel a warm sense of hospitality through a deep experience of Japanese culture. “Transforming Jinbocho into a manga district.” That’s one of our visions. We are coming up with original goods in collaboration with Nells, a pyjamas brand with a revolutionary concept to create pyjamas that look good enough to go out in. The goods are in the form of pyjamas designed sophisticatedly based on the theme of manga and “that look good enough to go out”—the distinctive characteristic of Nells. Soak in the world of manga both in body and soul and take your night of manga to another level with these pyjamas. MANGA ART HOTEL, TOKYO has appointed up-and-coming architect Tan Yamanouchi, winner for the Architects of the Year 2017 award to take charge of the hotel’s architectural design and brand development. By making use of the building structure as it is and combining various architectural materials, furniture, bookshelves, and 5,000 colorful mangas, we have created a space which resembles an ecosystem where diverse organisms coexist. The idea was to provide a modern translation for the ancient Japanese philosophy and belief that a deity resides in every individual object. 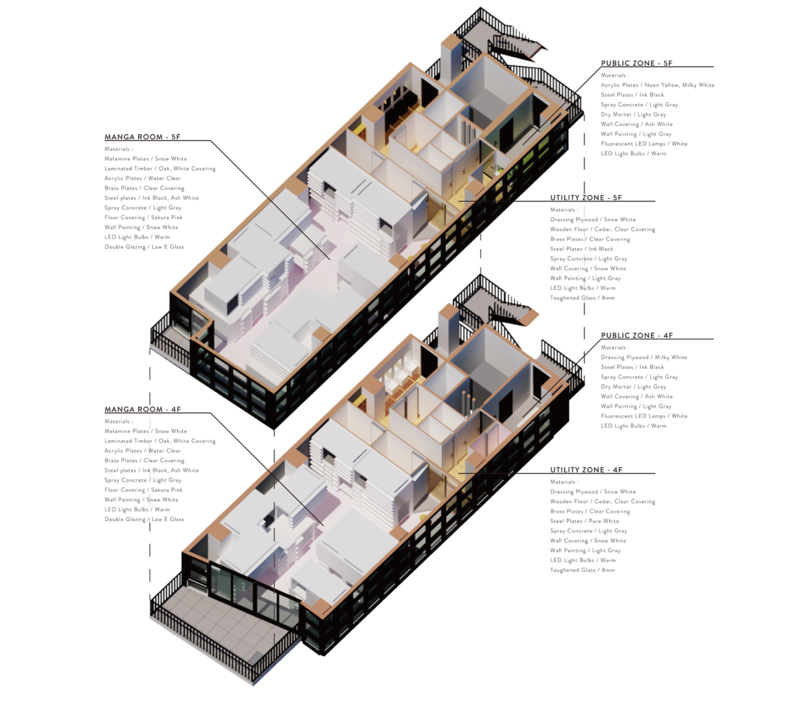 More concretely, the space consists of three zones: The public zone which houses the reception, utility zones with water and plumbing, and the guest room zone. The concrete, acrylic, and neon signs create an urban vibe to the public zone which doubles as a link to the city. With wooden floors, white walls, and dim lighting, the utility zone has a comfortable and homey feeling. Lastly, the main guest room zone looks elegant, clean, and fresh with randomly placed white boxes, bookshelves, light pink beds, and chic furniture. By connecting these three zones with tunnel-like channels, we have created an extraordinary ambience as if one is lost in a mysterious world, providing an entrance into the world of manga. Architecture is one of Japan’s most prominent culture. Japan is a country which continues to churn out globally renowned architects and home to one of the best architectural cultures in the world. However, in its current state, the topic of architecture isn’t one that easily reaches the general public. With that in mind, we hope to convey the charms of the building itself to an even wider audience by not only having the architect design a building but also take charge of its brand development. 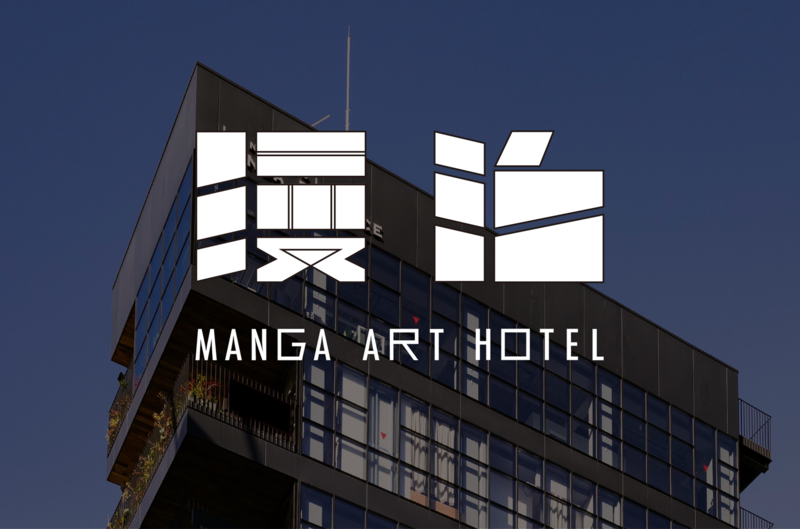 The attractiveness of the building and the associated brand will also become the attractiveness of MANGA ART HOTEL, TOKYO. This isn’t something done in passing, a side-hobby in one’s free time, or something done to kill time. Instead, it’s an overnight manga experience planned intentionally for the sole purpose of soaking in the world of manga. you reach for book after book, absorbed in reading. This comfortable feeling of defeat for manga. Probably everybody has felt this before. You’re in trouble if you discover a good series. Be drawn into the wonderful world of manga. Now, let’s lose ourselves to the irresistible power of manga tonight. After co-founding dot inc., he has managed a total of 400 rooms of unmanned simple hostels, Japanese-style inns, and manned hostels all over Japan. Bachelor of Science in Engineering from Keio University. Master’s in City Innovation from Yokohama National University’s Graduate School of Urban Innovation. At graduate school, He studied systems development on his own and established a systems production company in 2013. In 2015, he delved into the business of hotel operations and housing and accommodation and started dot inc with Mikoshiba. After graduating from a Master’s program at Keio University, Yamanouchi started his career in MD (Market Design) at Hakuhodo. He gained experience in communications design at major companies and in in-house venture start-ups. Soon after that, he quit and advanced his career to become an architect. In 2017, he won “Architects of the Year award 2017”. A pyjamas brand that provides a fun sleeping experience and designed for women who like to be stylish. overturning the conventional functions of pyjamas. Being able to meet a wonderful manga series you have yet to read. And getting sucked into its wonderful world for an entire night. That’s just the kind of place we would like to create. That was our inspiration for MANGA ART HOTEL, TOKYO. and even enjoy as an artwork. and are just amazing pieces of literature. We would like to provide this experience to as many people as possible. Not only to the people of Japan, but to people around the world. in a perfectly comfortable and enjoyable space.